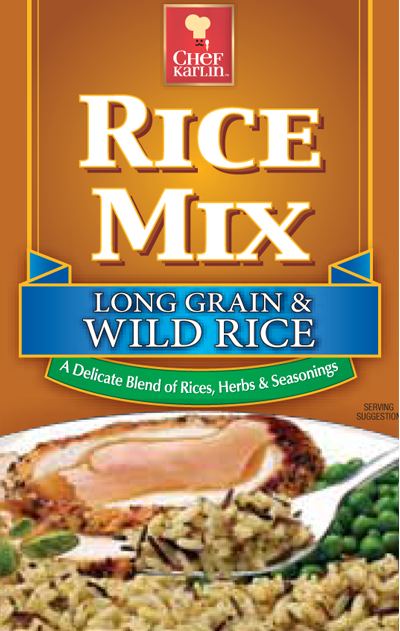 Ingredients: Enriched Long Grain Rice (Rice, Iron, Niacin, Thiamine Mononitrate, Folic Acid), Wild Rice, Whey (from milk), Hydrolyzed Soy Protein, Salt, Vegetables (Onion, Spinach, Garlic, Celery, Tomato, Carrots)*, Yeast Extract, Spices, Soybean Oil, Natural Flavors. In a saucepan, combine 2 ¼ cups water and 1 tablespoon butter or margarine (optional). Stir in rice and contents of seasoning packet. Heat mixture to a boil. Cover tightly, reduce heat and simmer until all the water is absorbed (about 25 minutes). Stir occasionally to prevent sticking. In a 2-quart microwaveable bowl or casserole, combine 2 ¼ cups hot water, rice, contents of seasoning packet and 1-tablespoon butter or margarine (optional). Cover and cook on HIGH for about 5 minutes, stirring occasionally. Reduce heat to 50% power and cook 24 to 28 minutes or until most of the water is absorbed and the rice is tender. Remove from oven and let stand covered until remaining water is absorbed (about 5 minutes).